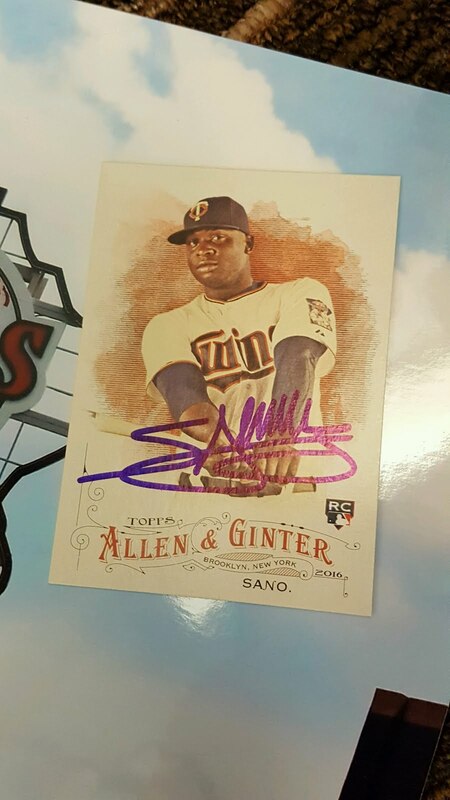 Miguel Sano signed my Allen & Ginter. 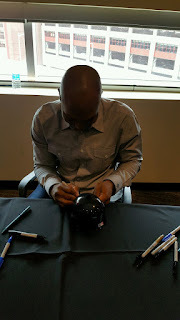 Torii Hunter signing my mini helmet. 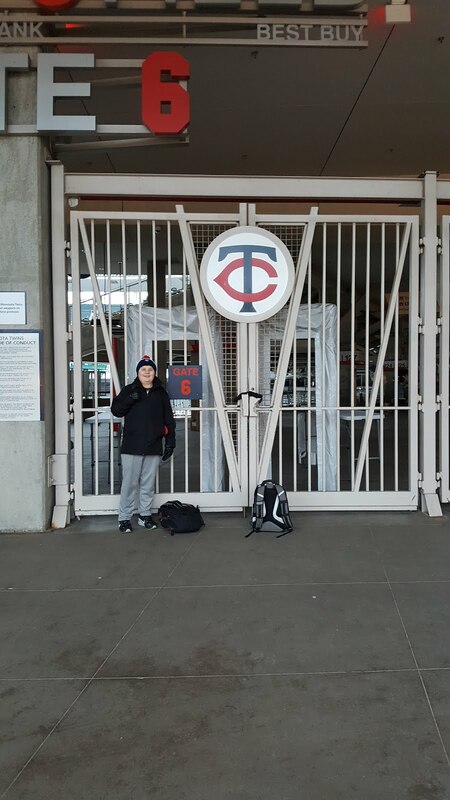 We're about 50th in line for Mauer and Cuddyer. On our way to the first day of TwinsFest. Today I added a 1961 Topps to my set. 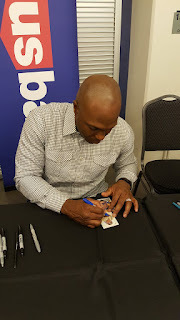 Pumpsie Green signed his card for a $5 fee. This is the first of 10 that I set for my goal this year for 1961 Topps. I ended up catching a cold Saturday so even if I had wanted to, I probably wouldn't have gone back on Sunday. I won't repost the items I posted during the event, but I'll post the rest of the items. Friday night, we started off by getting Brian Dozier, who signed my 2016 Allen & Ginter. After that, we went to Torii Hunter's line where he signed my 2003 Topps Heritage and 2015 Allen & Ginter. 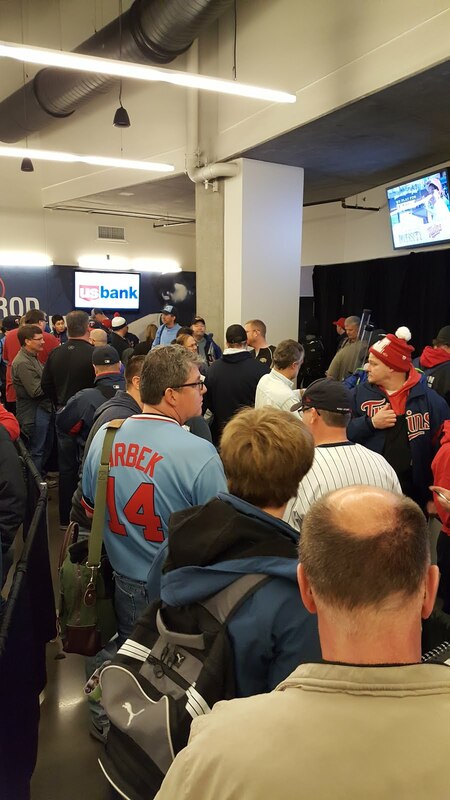 Finally, we went through the line with a group of 1987 Twins players (and a coach). 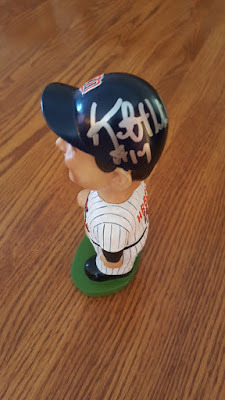 I had Kent Hrbek sign his 2001 season ticket holder bobblehead. Tom Kelly signed his 2002 stadium giveaway bobblehead. 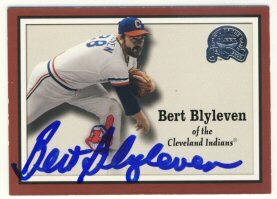 Bert Blyleven signed his 2000 Fleer Greats of the Game card. 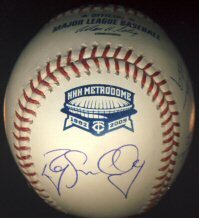 I had the rest of them sign a Metrodome commemorative ball. That was it for Friday night. 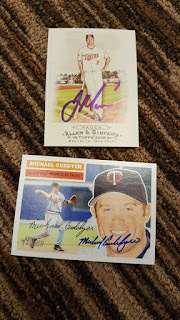 Saturday morning we started out in the Mauer/Cuddyer line. 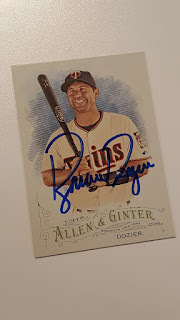 Mauer signed his 2009 Allen & Ginter, which completed that Twins set for me. Cuddyer signed his 2005 Topps Heritage. 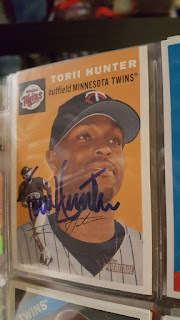 Then we went to the Torii Hunter and Jacque Jones line. 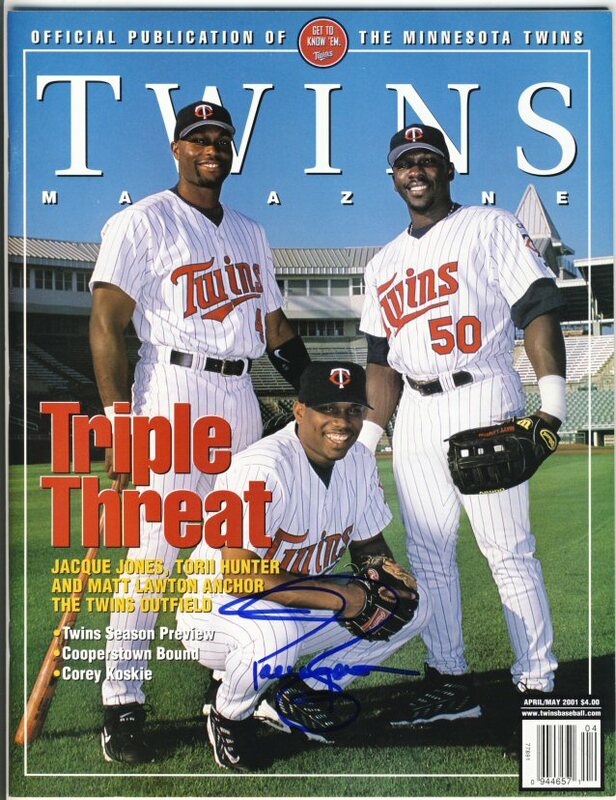 Torii signed a mini helmet, and Jacque Jones signed a Twins magazine for me. I had expected Matt Lawton to be there as well, and was going to have all three sign it but Lawton was dropped from the schedule about a week before the event. 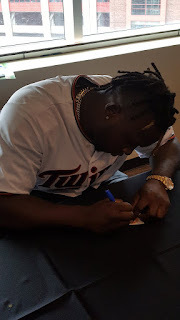 Next, we saw Miguel Sano and Neil Allen. 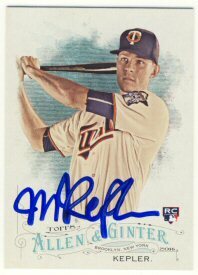 Sano signed his 2016 Allen & Ginter and Neil Allen signed a Target Field picture. Finally, we saw Max Kepler, Corey Koskie, Aaron Slegers and Alex Wimmers. Kepler signed his 2016 Allen & Ginter. 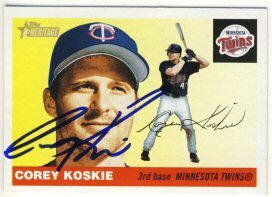 Koskie signed his 2004 Topps Heritage. 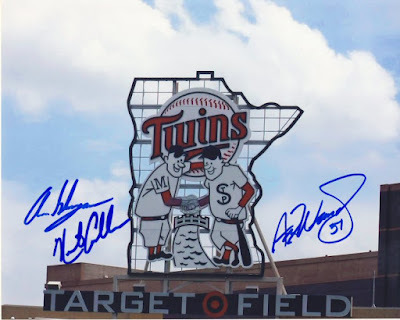 And Sleger and Wimmers signed my Target Field picture. That was it. I got a decent start on the 2016 Allen & Ginter set, but still have a long way to go. 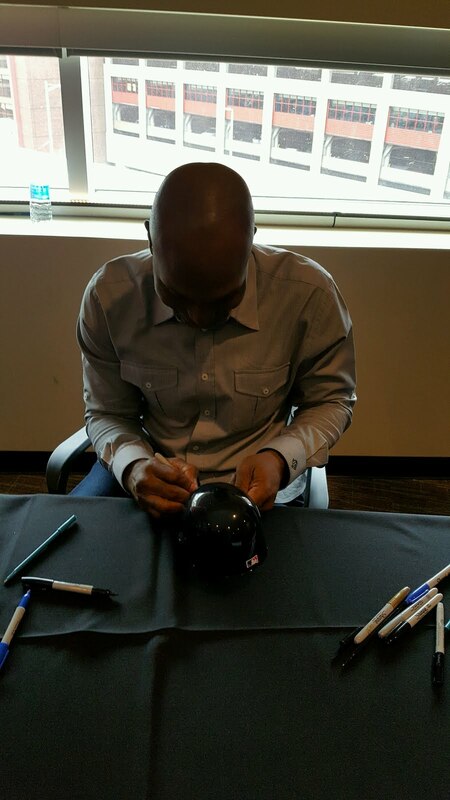 I was happy to add a Torii Hunter mini helmet to my collection, and the two bobbleheads I got signed helped me meet my goal for the year. 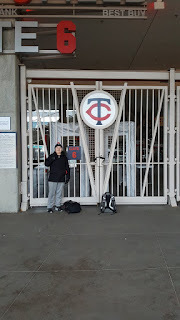 I saw the guys I normally see each year at TwinsFest: Steve, Zane and Randy, and also met Zach while standing in line, who is also an SCN member and whose thread I had posted on a week or two earlier! I had fun with my nephew. We had each other to talk to and played a little Trivia Crack while we waited. We tied 1-1, and quit because our phone batteries were draining. Luckily we wanted to get all the same players so we never had to split up. Logistically, everything went well. We got all the lines we wanted, but didn't risk trying to get to multiple lines per session. With the sessions being only an hour now, it's pretty tough to get to more than one, especially if you want to get in line for someone you really want in the next session. 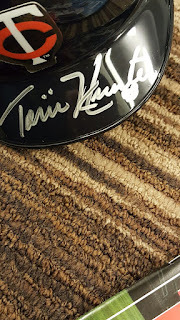 Each year it seems harder and harder to get the autographs you want, and this year was the least I've spent in all the years I've gone. That's too bad both for me, and for the Twins Community Fund that receives the proceeds from the event. The last line for us started about 15 minutes late, but we're done. 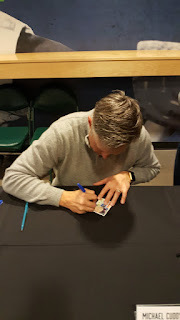 Kepler signed an Allen & Ginter for me. We're done for today and probably for the weekend. I'm not too fired up with the lineup for Sunday so I think I'll sleep in. We got through the Hunter and Jones line quickly and got right back in the same line for Sano and Neil Allen. 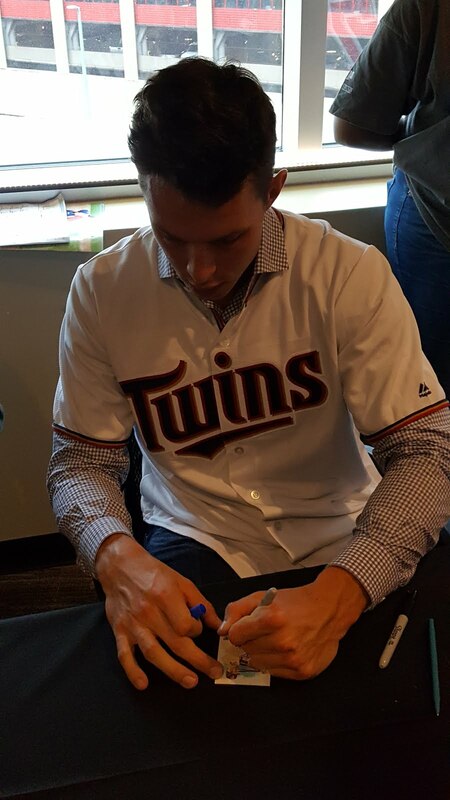 Then we'll get right back in the same line for Max Kepler. But they don't sign for another hour and 15 minutes. It's a long walk from our gate to the line, but we're in great shape. It's relatively warm again this morning. 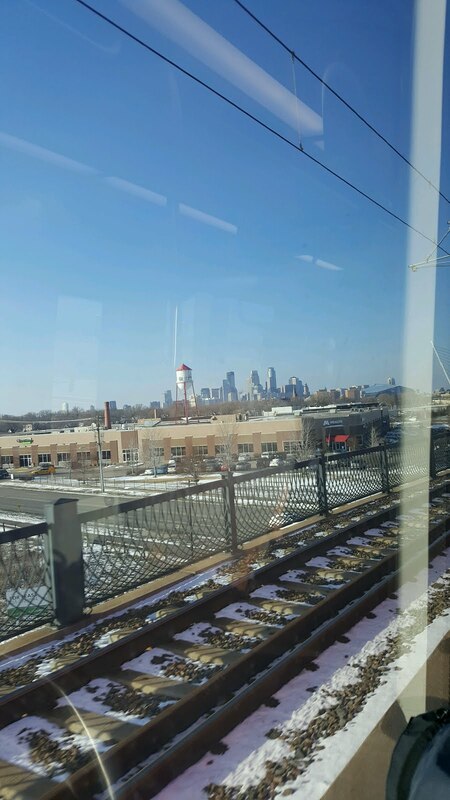 25 degrees. It's a bit windy though. We'll need to stand outside for an hour. They let me pay for two, but I was the last one to be able to get more than one. 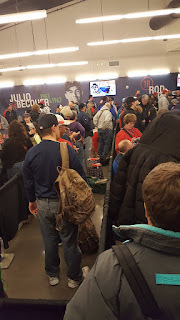 We got through the 87 Twins line with 15 minutes to spare. 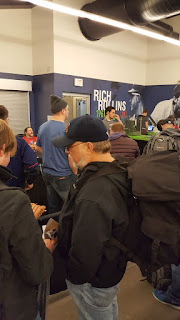 We're going to look at the card show a while before heading home. We're about 150th in line! Now we're in a very long line for members of the 1987 team. It was the warmest wait to get in that ice ever had. 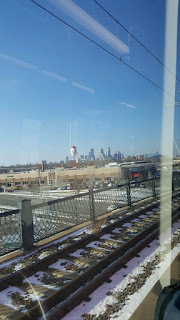 Still cold, but not painfully cold. 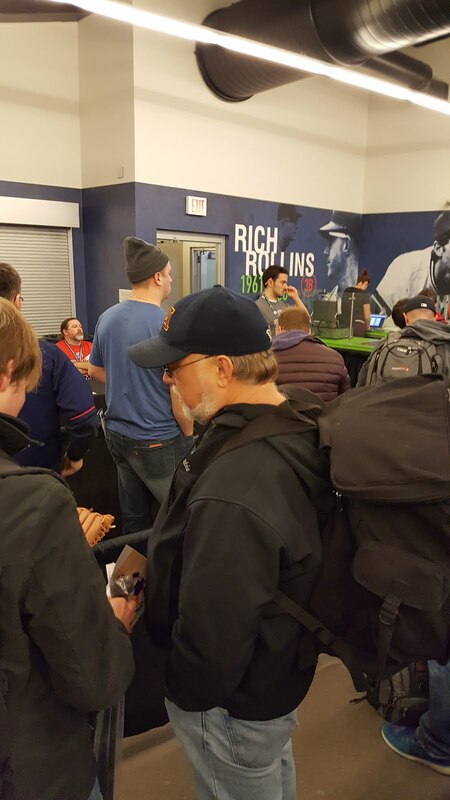 We're about 50 people back for Dozier. 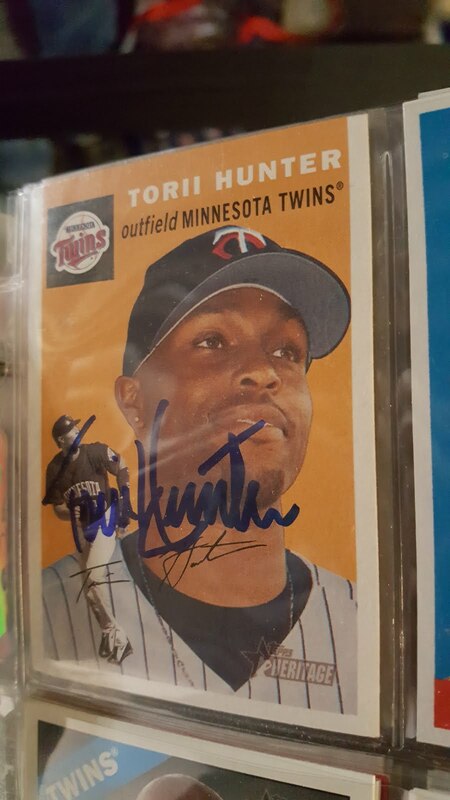 Now we're waiting for Torii Hunter. 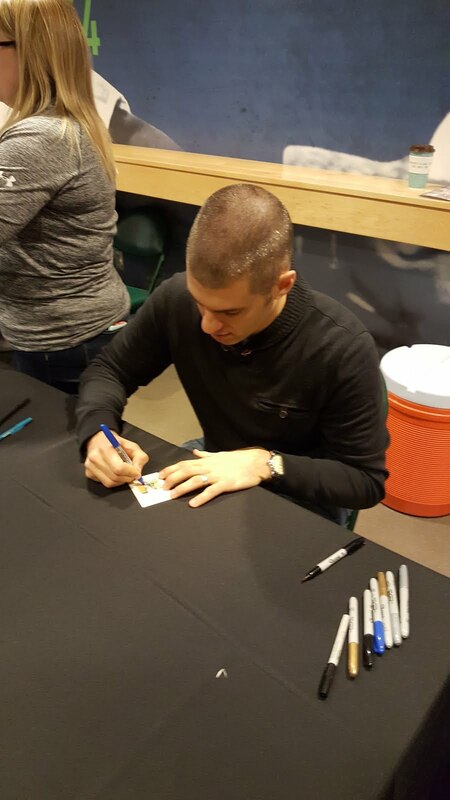 In the Dozier line, they were allowing people to pay for multiple autographs. 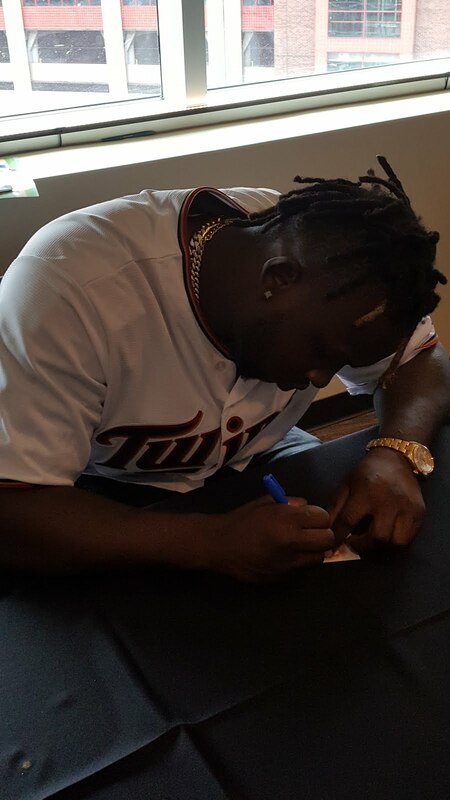 I have never seen that before at TwinsFest. The line for Hunter is not long. They are handing out numbers to keep your place, and letting you leave and come back closer to the start time. Another first. It does not seem very crowded at all. We're a little earlier than planned. The gates open in just over an hour. We're 12th in line. One return today. 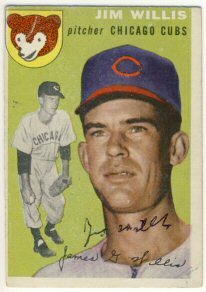 Jim Willis signed his 1954 Topps for me. I had asked a question in my letter and it was answered nicely in someone else's writing, but signed just as his card was signed. So someone is helping him answer his mail and although it appears he may struggle a little to sign (he is almost 90 years old), he is still answering his fan mail. It's returns like these that really make this hobby fun and I'm grateful that people like Mr. Willis are generous enough to take the time and effort to return my requests. 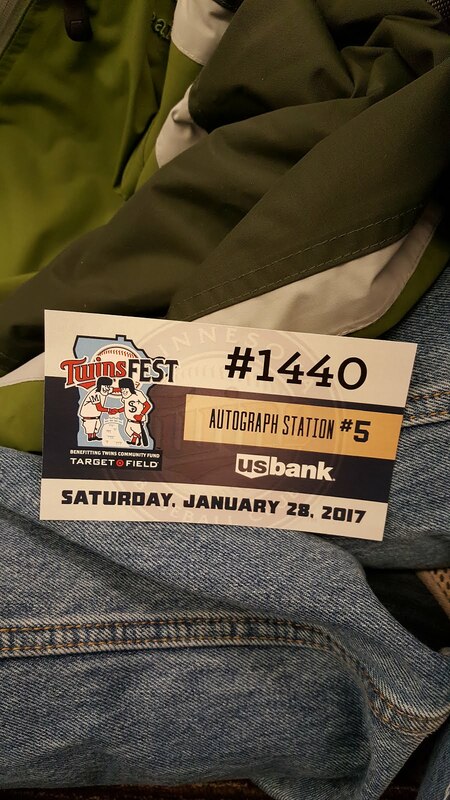 I'm getting ready for TwinsFest this weekend. I was disappointed that Matt Lawton isn't on the schedule. 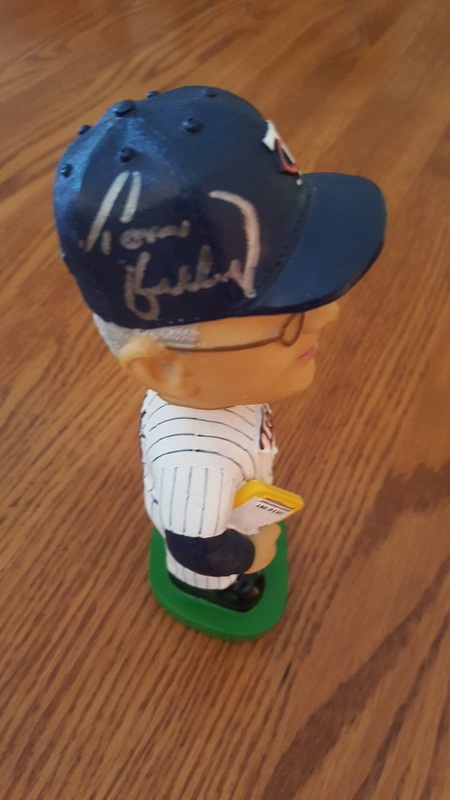 He was listed in the list of players that would be attended, so I bought a bobblehead and some magazines, and then he wasn't on the list for the final schedule. 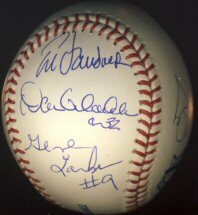 There is a session on Friday evening that includes nine players and coaches from the 1987 World Series team. My nephew and I are planning go to that one. No surprises other than that. The weather looks lie it should be okay. Not the usual below-zero wind chills that usually seem to occur over this weekend. Another return today. Two in one week! 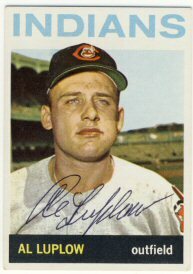 Al Luplow signed his 1963 and 1964 Topps. I haven't sent to Mr. Luplow before. It's nice to add a few players I don't already have. 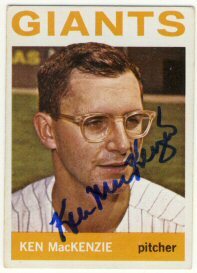 Today I received my first return of the year: Ken MacKenzie. 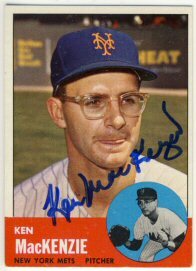 Mr. MacKenzie was kind enough to sign his 1963 and 1964 Topps. 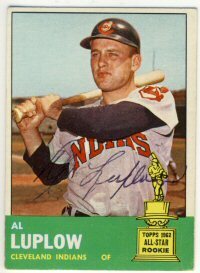 This helps me get one of the five cards I set as a goal for the 1963 set for the year. I'm wondering if five was too low of a goal. I spent some time on Ebay looking for cards I need to send out for my sets. Many of the cards I need are short prints/hi number cards, so it's going to be expensive. 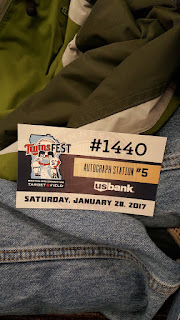 I'm about ready for TwinsFest. 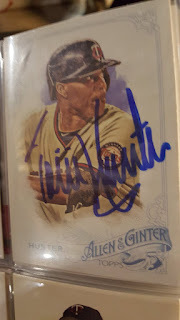 I have all the cards I'm going to have by that time after ordering a bunch of minor league cards of many of the players that I didn't have anything else for them to sign. I don't have any must-haves this year. I do have a Kent Hrbek bobblehead I'd like to get signed, but that shouldn't be a problem, unless they group him with someone super popular. My 2017 goals won't be much different than my 2016 goals. I have decided not to try to set a goal for TTM requests. Most of the cards I need now will probably have to be bought. I've also tried not to set goals that will require me to spend a ton of money, but we'll see how that goes. Goal - Add three signed cards to my 1958 set. 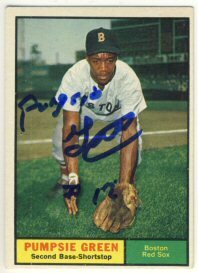 Goal - Add 10 signed cards to my 1961 set. I haven't worked on this very seriously so this will be a bit different this year. 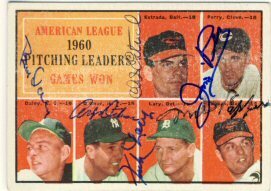 Goal - Add five signed cards to my 1963 set. Goal - Add five signed cards to my 1965 set. 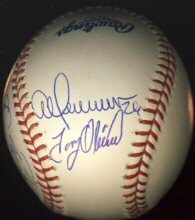 Goal - Add 10 signed cards to my 1972 set. Goal - Add two signed bobbleheads to my collection. That's it. It doesn't sounds like much, but I've made good progress on many of my sets over the years and the remaining cards are getting expensive. 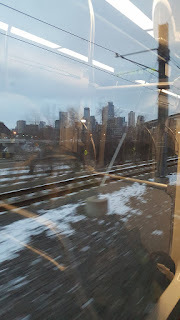 I do intend to go to TwinsFest later this month for at least two of the days. So far though, I don't think that event will help me make any progress on these goals, with the possible exception of the bobbleheads. I didn't do very well on my 2016 goals. Mainly because I just didn't get very excited about the 1978 Topps set I thought I'd work on. I really prefer the older players from the 1950's and 1960's. Unfortunately, we've been losing quite of few of those guys. Goal - Add three cards to my 1958 set. - I met this goal by adding four cards. Goal - Add 10 cards to my 1963 set. - I met this goal by adding 12 cards. Goal - Add 5 cards to my 1965 set. - I only added one card to this set this year!!! Goal - Add 10 cards to my 1972 set. - I added exactly 10, so I met this goal. Goal - Add 75 cards to my 1978 set. - I only added 16. I made one or two mailings in the first half of the year but lost interest after that. Goal - Send out 150 TTM requests - I only sent out 52, and so far have my lowest annual return rate at just 75%. I usually have a success rate of over 90%. Goal - Get two bobbleheads signed. 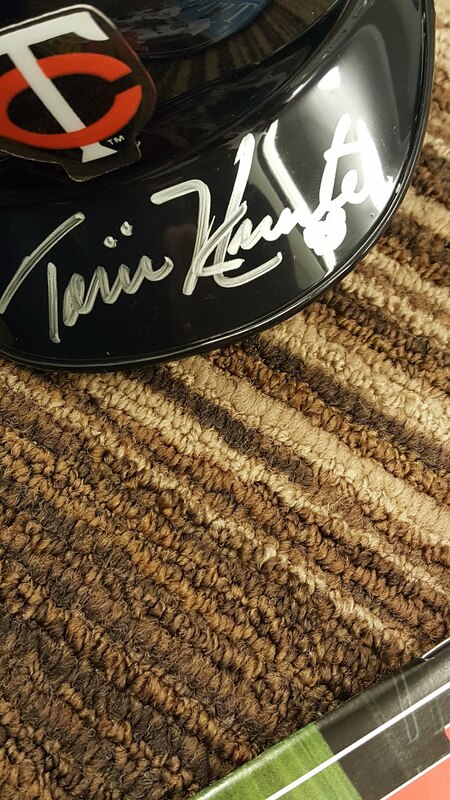 - I didn't get any signed. Goal - Get three magazines signed ttm - I didn't send out any. I have to give some thought to my 2017 goals. I am going to TwinsFest this year, so I might have a chance at a couple bobbleheads, although I'm running out of bobbleheads to get signed. It's also getting tough to make much progress on my sets. Most of my new additions are purchases, as I've sent out to most of the good signers already.